The new CEO of Nokia Rajiv Suri, recently mapped out the future of the telecommunications giant from Finland after its purchase by Microsoft: Unfortunately, Nokia is not planning to make phones. “We’re not looking directly return to consumers,” he said, but added that there is great interest in licensing the brand so at some point in the long run, the Nokia name could be returned to the consumer world. Something like this is, in fact, already materialized with Nokia N1 pill that is made by Foxconn. As with other aspects of the company, he said that their brand HERE navigation software will be in direct competition with Google Maps but will instead rely more on third-party licensing. In any case, Nokia was once the leader of the mobile phone industry, with a number of excellent choices, as long as Apple has not launched the first smartphone and turned the market. 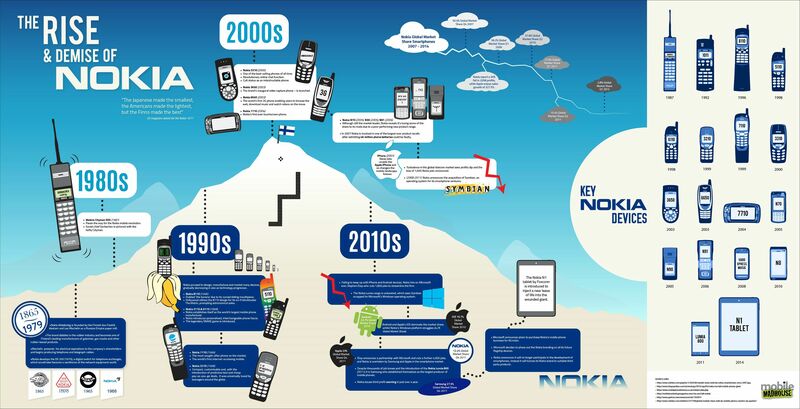 Attached you can see infographic (click to enlarge) shows the rise and fall of Nokia that has occurred.